Home Anime Miss Kobayashi’s Dragon Maid season 2 is confirmed! Kyoani fans, get in here! Last 2017, Kyoto Animation made fans of all things moe jump for joy with their anime adaptation of Coolkyoushinja’s manga series, Miss Kobayashi’s Dragon Maid (Kobayashi-san Chi no Meidoragon in Japanese). The thing is though, the anime only had 13 episodes plus 1 OVA, leaving fans wanting for more. If you liked the anime (just like us), here’s some good news for you — it was recently confirmed that the Miss Kobayashi’s Dragon Maid is getting a second season! The anime’s second season was reported by anime news site Moetron just last weekend. While the first announcement was unconfirmed, a quick update revealed an image of the manga’s eighth volume with confirmation of Kobayashi-san season 2. While season 2 has been officially confirmed, Kyoto Animation is yet to reveal S2’s release date. Here’s hoping the anime comes out real soon! 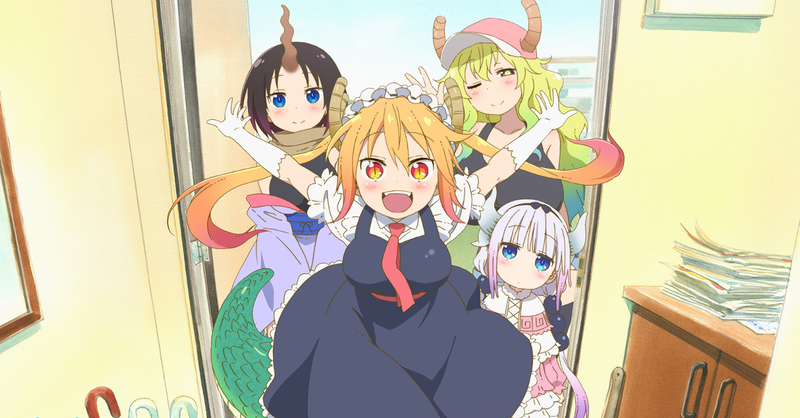 In case you haven’t watched the anime yet, Miss Kobayashi’s Dragon Maid follows Kobayashi, a programmer who by chance rescues a fearsome dragon who transforms into a cute young maid named Tohru. As thanks for saving her, Tohru becomes Kobayashi’s personal maid, though this attracts the attention of dragons and other mythical beings.